One of the most common frustrations we hear from prospective customers is a lack of interest from employees in training and development programs. Often employees show high initial engagement, but either lose interest or forget about the opportunity without continued exposure. Keeping learning top of mind and exciting for employees can be challenge, so we built a toolkit to help our community increase usage and engagement around their elearning initiatives. 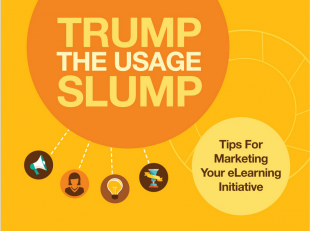 Download your free copy of “Trump the Usage Slump: Tips for Marketing Your eLearning Initiative” and get your employees excited about learning at your company!